The documentary featured in this entry is out of the Alex Jones (Infowars.com) camp, and gives us a birds eye view of the how bad off we are as it relates to once being a proud powerful freedom loving republic. Secret FEMA North Korea style prison camps are uncovered in America, and exposed in this film along with commentary about what these FEMA camps may be on stand-by waiting for. Has a Red Dawn begun in America? FEMA is short for the Federal Emergency Management Agency and was formed out of a combination of 10 other federal agencies. Now its part of Homeland Security. 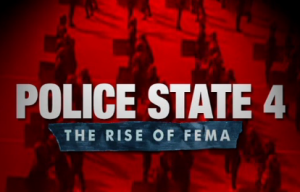 FEMA is the federal agency assigned to take the rights of the people away during the event of a national emergency. A secret network of North Korea style prison camps exists in America, and this documentary proves it. Government is allowed to take over all communication, personal cars and trucks, all highways and seaports, food resources and farms, and can enslave the public. All made possible by executive orders. Cops and government officials have also been cited as pretending to be demonstrators (adding to the anarchy) in an attempt to falsely justify military action on the American people.